SEO is hard enough when you’re only trying to rank in one language. But add a few more languages to the mix? Well, yeah, WordPress multilingual SEO can feel a little overwhelming. It doesn’t have to, though. Multilingual SEO is really just about applying all those same SEO principles and then also following some basic guidelines to make sure that each language has the same chance to benefit from your SEO efforts and rank in Google. In this tutorial, we’ll cover those best multilingual SEO principles so that you can have all your site’s translations ranking. You’ll still need to build some links and do some keyword research – but this guide will make sure Google can index all your content and serve up the right translation to visitors from around the world. Let’s start at the beginning – you can’t rank your multilingual WordPress site if Google can’t index it. Services like Google Translate have made it easy to let people dynamically translate your website into any language (kind of like how the Chrome Browser can automatically translate text). Now, that type of translation is fine if you want to let people who are already on your site browse your content in their own language. But it’s not what you want for multilingual SEO. If you’re serious about multilingual SEO, you need a tool that will help you create static, crawlable versions of your site. That means each language version needs a different URL. For example, if you have a German translation of your site, it needs to have its own URL structure like de.yoursite.com or yoursite.com/de. Speaking of URLs let’s see how to pick the right URL structure. Search engines are pretty flexible with how you structure the URLs of your multilingual site, but Google does have some tips for how to choose the best URL structure. Doesn’t let you use the geotargeting functionality in Google Search Console (more on that later). The TranslatePress plugin uses subfolders for each language, which is one of Google’s recommended approaches. The URL slug for individual pieces of content. Why does that matter? Well, beyond just being more user-friendly, a good general SEO strategy is to use your primary keywords in your URL slug. So if you can’t translate the URL slug for each piece of content, you lose the ability to include your primary keyword in other languages, which hurts your translations’ SEO optimization. Using TranslatePress’SEO Pack add-on you’ll be able to fully translate the URL slug in each language (directly from the front-end). The hreflang attribute is a small code snippet that you can add to the <head> section of your site. Your human visitors will never see it, but it helps search engines like Google understand the different languages on your site and point searchers to the translation that’s most appropriate for their language. Let’s make the example more concrete and say you have two versions of the same content. One version is English, the other is German. The hreflang tag lets Google know which version is which so that Google can serve the English version to English searchers and the German version to German searchers (Google will try to do this by itself, but the hreflang tag makes sure Google gets it right). Where hreflang gets really helpful is when you have different variants of the same language. For example, maybe you have one page for Spanish speakers from Spain and another for Spanish speakers from Mexico. The hreflang attribute would ensure that searchers from each location get the proper localized version. If you’re using WordPress, the TranslatePress plugin will automatically add the hreflang attribute for each language that your site uses. An XML sitemap is basically a “map” of all the content on your site. It helps Google find all your content and is just generally a good basic SEO principle. For a single-language site, creating an XML sitemap is pretty straightforward. In fact, most SEO plugins will automatically create a sitemap for you without you having to lift a finger. However, things get a little bit trickier when you have a multilingual website because each piece of content is available in different languages at different URLs. Furthermore, Google actually has a specific format that they want you to use in your multilingual sitemap. TranslatePress’ SEO Pack add-on integrates with Yoast SEO’s sitemap functionality to help you automatically implement a multilingual sitemap that follows Google’s recommendations. Ok, this one isn’t a hard-and-fast rule, and we’re certainly not trying to say that automatic translation is always bad. However, if you do opt to use automatic translations for part of your site, Google recommends that you use your site’s robots.txt file to block search engines from crawling the automatically translated content. So – for the content that you want to rank well – it’s worth spending some time to at least manually review any automatic translations that you use. Your content’s title and meta description are what normally shows up in Google’s organic search results. It’s important to write a quality title and meta description to boost your organic CTR. And you also usually want to work your focus keyword into the title if at all possible. On WordPress, you’ll use a WordPress SEO plugin like Yoast SEO to control this information for each page. However, if the translation plugin that you choose doesn’t let you translate the title and meta description for each language, you’re going to miss out on the SEO benefits for the translated versions of your content. So – make sure that you pick a translation plugin that will let you translate SEO metadata and other plugin data (which TranslatePress does). Google Search Console is an important SEO tool that lets you view analytics and manage how your site appears in Google search. You can learn more here. Or, if you’ve already added your site to Google Search Console, you can head straight to the International Targeting report. Improve Your WordPress Site’s Multilingual SEO Today! TranslatePress, along with its SEO Pack add-on, is built with all of these multilingual SEO best practices in mind. 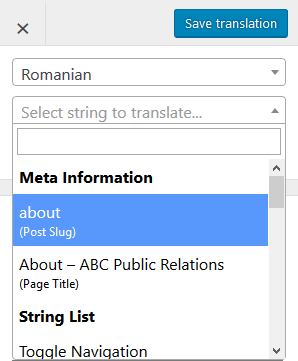 Translatable URL slugs, SEO metadata, image alt tags, social metadata, etc. 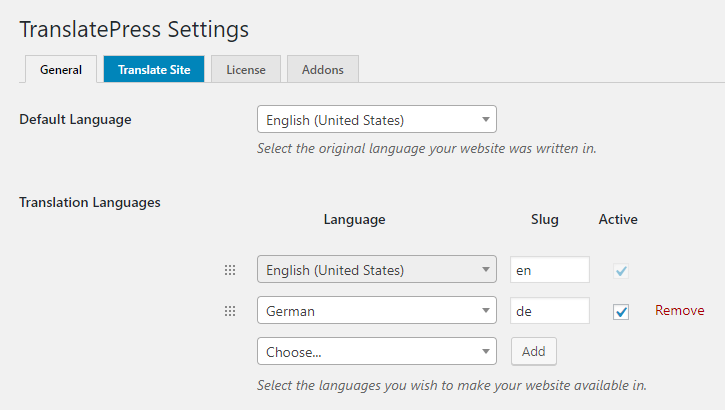 To learn more about how TranslatePress can help you create a multilingual WordPress site (or WooCommerce store), check out all of the features.